Trained, certified technicians provide on-site emergency services 24/7. Our fleet of service trucks are equipped with the latest repair and diagnostic tools. 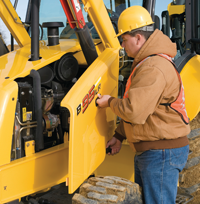 When one of your machines is down, you can count on us to come to your job site to repair your equipment as quickly as possible. We understand that you might have a problem on a weekend or evening, and our technicians are available whenever you need us. Franklin Equipment has Class-A CDL drivers readily available for equipment pick-up and delivery. We ensure compliance with safety and weight regulations and can retrieve disabled units with our trucks, which are equipped with a cable winch. When your job requires 40 or more hours of labor, you can purchase labor blocks at special rates. Labor block jobs are given top priority when scheduling field mechanics. With these jobs, labor charges include only time actually spent on the job site; there are no travel charges.